Histological evidence of enteropathy (inflammatory infiltrate, villus blunting) seen in this intestinal biopsy from a child with malnutrition. Environmental enteropathy (EE) (also known as tropical enteropathy or environmental enteric dysfunction) is a disorder of chronic intestinal inflammation. EE is most common amongst children living in low-resource settings. Acute symptoms are typically minimal or absent. EE can lead to malnutrition, anemia (iron-deficiency anemia and anemia of chronic inflammation), growth stunting, impaired brain development, and impaired response to oral vaccinations. The cause of EE is multifactorial. Overall, exposure to contaminated food and water leads to a generalized state of intestinal inflammation. The inflammatory response results in multiple pathological changes to the gastrointestinal tract: Smaller villi, larger crypts (called crypt hyperplasia), increased permeability, and inflammatory cell build-up within the intestines. These changes result in poor absorption of food, vitamins and minerals. Standardized, clinically practical diagnostic criteria do not exist. The most accurate diagnostic test is intestinal biopsy. However, this test is invasive and unnecessary for most patients. Prevention is the strongest and most reliable option for preventing EE and its effects. Therefore, prevention and treatment of EE are often discussed together. Environmental enteropathy is believed to result in chronic malnutrition and subsequent growth stunting (low height-for-age measurement) as well as other child development deficits. EE is rarely symptomatic and is considered a subclinical condition. However, adults may have mild symptoms or malabsorption such as altered stool consistency, increased stool frequency and weight loss. EE causes malnutrition by way of both malabsorption and nutritional deficiencies. The first two years (and the prior 9 months of fetal life) are critical for linear growth. Stunting is an easy to measure symptom of these child development deficits. Many oral vaccines, both live and non-living, have proven to be less immunogenic or less protective when administered to infants, children or adults living in low socioeconomic conditions in developing countries than they are when used in industrialized countries. Widespread EE is hypothesized to be a contributing cause for this observation. 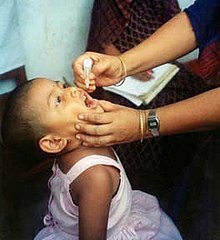 Child receiving oral polio vaccine. There is some evidence that the enteric dysfunction characteristic of EE may impair the efficacy of oral vaccinations. The development of EE is multifactorial, but predominantly associated with chronic exposure to contaminated food and water. This is especially true in environments where widespread open defecation and lack of sanitation are common. Long-term exposure to environmental pathogens leads to a generalized state of intestinal inflammation. Chronic inflammation leads to both functional and structural changes which alter gut permeability and ability of the intestine to absorb nutrients. Evidence of villous atrophy in endoscopic images of the small intestine. Specifically, structural changes within the intestine include smaller villi, larger crypts (called crypt hyperplasia), increased permeability, and inflammatory cell build-up within the intestines. These changes result in poor absorption of food, vitamins and minerals – or "modest malabsorption". Simplified mechanism outlining causes and effects of EE. However, this procedure is considered too invasive, complex and expensive to be implemented as standard of care. As a result, there are various research efforts underway to identify biomarkers associated with EE, which could serve as less invasive, yet representative, tools to screen for and identify EE from stool samples. In an effort to identify simple, accurate diagnostic tests for EE, the Bill and Melinda Gates Foundation (BMGF) has established an EE biomarkers consortium as part of their Global Grand Challenges initiative (specifically, the Discover Biomarkers of Gut Function challenge). It is postulated that the limited of understanding of EE is partially due to the paucity of reliable biomarkers, making it difficult for researchers to track the epidemiology of the condition and assess the efficacy of interventions. In the 1960s, researchers reported a syndrome of non-specific histopathological and functional changes to the small intestine in individuals living in unsanitary conditions. This syndrome was observed predominantly in tropical regions across Latin America, sub-Saharan Africa and Asia. The geographic distribution of the syndrome lead to the original term of "tropical enteropathy" (sometimes also "tropical jejunopathy"). Following initial reports, further investigation revealed that these symptoms were not specific to tropical climates. For example, individuals in more wealthy tropical countries, such as Qatar and Singapore, did not exhibit these symptoms. Similarly, subsequent studies have shown this condition to be common across the developing world, closely associated with impoverished conditions but independent of climate or geography. As a result, the term "environmental enteropathy" was introduced to specify that this condition is not only found in tropical areas and is believed to be caused by environmental factors. Treatment focuses on addressing the central components of intestinal inflammation, bacterial overgrowth and nutritional supplementation. Sanitary measures, such as hand-washing before preparing food, is recommended in the prevention of EE. Prevention focuses on improving access to water, sanitation and hygiene (WASH). Another important factor might be contaminated soil in child play spaces, often caused by the presence of livestock such as chicken in the household. Creating a clean play space might therefore be an effective preventive measure for EE in toddlers. There are multiple large-field, multi-country research initiatives focusing on strategies to prevent and treat EE. ^ a b c d e f g h i j k l Louis-Auguste, John; Kelly, Paul (2017-07-01). "Tropical Enteropathies". Current Gastroenterology Reports. 19 (7): 29. doi:10.1007/s11894-017-0570-0. PMC 5443857. PMID 28540669. ^ a b c d e f g h i j k l m n o Ali, A; Iqbal, NT; Sadiq, K (January 2016). "Environmental enteropathy". Current Opinion in Gastroenterology. 32 (1): 12–7. doi:10.1097/MOG.0000000000000226. PMID 26574871. ^ a b c d e f g h i j k l m Korpe, PS; Petri WA, Jr (June 2012). "Environmental enteropathy: critical implications of a poorly understood condition". Trends in Molecular Medicine. 18 (6): 328–36. doi:10.1016/j.molmed.2012.04.007. PMC 3372657. PMID 22633998. ^ Ngure, FM; Reid, BM; Humphrey, JH; Mbuya, MN; Pelto, G; Stoltzfus, RJ (January 2014). "Water, sanitation, and hygiene (WASH), environmental enteropathy, nutrition, and early child development: making the links". Annals of the New York Academy of Sciences. 1308: 118–28. doi:10.1111/nyas.12330. PMID 24571214. ^ a b Bhutta, Zulfiqar A.; Guerrant, Richard L.; Nelson, Charles A. (2017-04-01). "Neurodevelopment, Nutrition, and Inflammation: The Evolving Global Child Health Landscape". Pediatrics. 139 (Supplement 1): S12–S22. doi:10.1542/peds.2016-2828d. PMID 28562245. ^ a b John, Chandy C.; Black, Maureen M.; Nelson, Charles A. (2017-04-01). "Neurodevelopment: The Impact of Nutrition and Inflammation During Early to Middle Childhood in Low-Resource Settings". Pediatrics. 139 (Supplement 1): S59–S71. doi:10.1542/peds.2016-2828h. PMC 5694688. PMID 28562249. ^ Oriá, RB; Murray-Kolb, LE; Scharf, RJ; Pendergast, LL; Lang, DR; Kolling, GL; Guerrant, RL (June 2016). "Early-life enteric infections: relation between chronic systemic inflammation and poor cognition in children". Nutrition Reviews. 74 (6): 374–86. doi:10.1093/nutrit/nuw008. PMC 4892302. PMID 27142301. ^ a b Czerkinsky, Cecil; Holmgren, Jan (2015-06-19). "Vaccines against enteric infections for the developing world". Phil. Trans. R. Soc. B. 370 (1671): 20150142. doi:10.1098/rstb.2015.0142. PMC 4527397. PMID 25964464. ^ a b c d e f Prendergast, A; Kelly, P (May 2012). "Enteropathies in the developing world: neglected effects on global health". The American Journal of Tropical Medicine and Hygiene. 86 (5): 756–63. doi:10.4269/ajtmh.2012.11-0743. PMC 3335677. PMID 22556071. ^ Humphrey, JH (2009). "Child undernutrition, tropical enteropathy, toilets, and handwashing". Lancet. 374 (9694): 1032–5. doi:10.1016/s0140-6736(09)60950-8. PMID 19766883. ^ Mbuya, MN; Humphrey, JH (May 2016). "Preventing environmental enteric dysfunction through improved water, sanitation and hygiene: an opportunity for stunting reduction in developing countries". Maternal & Child Nutrition. 12 Suppl 1: 106–20. doi:10.1111/mcn.12220. PMC 5019251. PMID 26542185. ^ Gilmartin, Allissia A.; Petri, William A. (2015-06-19). "Exploring the role of environmental enteropathy in malnutrition, infant development and oral vaccine response". Phil. Trans. R. Soc. B. 370 (1671): 20140143. doi:10.1098/rstb.2014.0143. PMC 4527388. PMID 25964455. ^ Louis-Auguste, John; Kelly, Paul (2017-07-01). "Tropical Enteropathies". Current Gastroenterology Reports. 19 (7): 29. doi:10.1007/s11894-017-0570-0. ISSN 1522-8037. PMC 5443857. PMID 28540669. ^ Mbuya, Mduduzi N. N.; Humphrey, Jean H. (2016-05-01). "Preventing environmental enteric dysfunction through improved water, sanitation and hygiene: an opportunity for stunting reduction in developing countries". Maternal & Child Nutrition. 12: 106–120. doi:10.1111/mcn.12220. ISSN 1740-8709. PMC 5019251. PMID 26542185. ^ Ngure, Francis M.; Reid, Brianna M.; Humphrey, Jean H.; Mbuya, Mduduzi N.; Pelto, Gretel; Stoltzfus, Rebecca J. (2014-01-01). "Water, sanitation, and hygiene (WASH), environmental enteropathy, nutrition, and early child development: making the links". Annals of the New York Academy of Sciences. 1308 (1): 118–128. doi:10.1111/nyas.12330. ISSN 1749-6632. PMID 24571214. ^ George, Christine Marie (11 December 2017). "Enteric Infections in Young Children are Associated with Environmental Enteropathy and Impaired Growth". Tropical Medicine and International Health. 23 (1): 26–33. doi:10.1111/tmi.13002. PMID 29121442. MAL-ED, The Interactions of Malnutrition & Enteric Infections: Consequences for Child Health and Development research project. This page was last edited on 1 February 2019, at 05:53 (UTC).